A majority of the 50 residents attending a Sept. 11 public hearing on Limestone’s proposal to withdraw from RSU 39 seemed to favor the effort, which supporters indicated would not cost taxpayers more and would give them back local control of education. LIMESTONE, Maine — A majority of the 50 residents attending a Sept. 11 public hearing on Limestone’s proposal to withdraw from RSU 39 seemed to favor the effort, which supporters indicated would not cost taxpayers more and would give them back local control of education. The community has actively sought withdrawal since officials with RSU 39, which serves the communities of Caribou, Limestone and Stockholm, proposed in March 2017 sending Limestone high schoolers to Caribou to offset a $1.4 million funding loss. Since then, the RSU 39 board did take action and move the high schoolers to Caribou and Limestone residents did form a withdrawal committee. The committee then petitioned for, and residents overwhelmingly supported, a special referendum question allocating $40,000 to pursue withdrawing from RSU 39. Following lengthy negotiations between the Limestone withdrawal committee members and RSU 39 officials, a withdrawal agreement was created. Now, residents of Limestone will vote that agreement up or down on Nov. 6. At least half of the residents who voted in the last gubernatorial election, or 334, need to cast ballots for the measure to be binding, and if the majority of voters are in favor, then Limestone will no longer be part of RSU 39 as of July 1 of next year. Should the withdrawal succeed, residents will need to elect a school board for the town and establish a new school district. During the Sept. 11 hearing on the referendum question, educational consultant Dr. Mark Eastman provided a summary of the agreement and answered questions from audience members. Notably, the discussion included a comparison of what Limestone is paying RSU 39 versus what the community would need to pay to maintain its own school, and the potential impact of withdrawal on the Maine School of Science and Mathematics, which shares space with Limestone Community School. One audience member asked for some clarification regarding Limestone’s expenses in relation to its share of the RSU 39 budget. The community’s current contribution represents about 15 percent of the total local share footed by the three member municipalities. A chart displayed during the meeting showed that, based on figures provided by RSU 39, Limestone has paid a higher amount each of the last few years to the school system compared to how much it would cost to operate their own school. For example, in the 2016-17 school year, the chart indicated that the town paid $2.7 million to RSU 39 while the actual expenses for Limestone Community School that year, when it still served local high schoolers, were about $2.3 million. For the 2017-18 year, with the removal of the high school classes, the town paid $2.6 million to RSU 39 while expenses for the now preK-8 school were roughly $1.9 million. Several residents also discussed the future of MSSM on the Limestone Community School campus. Currently, MSSM has an annual lease with RSU 39 in which its pays about $550,000 a year to use the facility. If Limestone withdraws, those buildings, along with the lease, would go back to the town. One member of the audience asked if there had been any conversations about sharing teachers and nurses with MSSM. Eastman said he was unsure and Beaulieu said the withdrawal committee had not yet entered into negotiations with MSSM’s director, as a withdrawal agreement has not yet been approved by the community. “They’re not ready to have this conversation until the withdrawal happens,” she said. “I don’t think they want to burn any bridges,” adding that they won’t be able to negotiate until the town owns the property. While some residents expressed concern that, if Limestone is unable to adequately assist MSSM in providing state of the art education to incoming students, MSSM officials may decide to relocate, Eastman cited Maine statute Title 20-A Chapter 312, in which the location of the school is written as Limestone and there is no clear indication that relocation is an option. 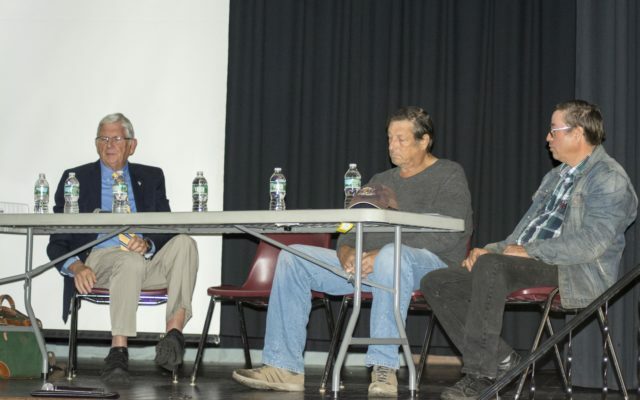 Comments and concerns expressed by Selectmen Fred Pelletier and Chris Durepo, as well as LCS teacher Irma LaBreck elicited applause from the audience, many of whom were enthusiastic at the possibility of regaining educational autonomy. Durepo commented on local concerns of MSSM “pulling out” of Limestone. LaBreck commented on the town’s current lack of authority when it comes to their school, adding that the town did not have enough representation to keep grades 9 to 12 when RSU 39 proposed removing them, and that even when the town votes down a referendum item, it is still outweighed by Caribou’s higher population.